PepsiCo, Inc. is a Fortune 500, American multinational corporation. They manufacture, market, and sell various snacks and beverages worldwide. Besides the Pepsi brands, the company owns the brands Quaker Oats, Gatorade, Frito-Lay, SoBe, Naked, Tropicana, Copella, Mountain Dew, Mirinda and 7 Up. 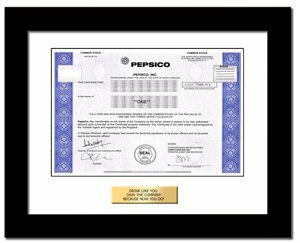 PepsiCo was founded in 1898 and is headquartered in Purchase, New York. PepsiCo stock for a pepsi addict!